Hayes & Yeading United showed great character to bounce back strongly from the mauling dished out by AFC Wimbledon just 48 hours earlier earning a vital three points against struggling Ebbsfleet United. Garry Haylock made three changes from the side that lost at Kingsmeadow as Adam Green, Ram Marwa and Marc Canham started in place of Dale Binns, Esmond James and the suspended Justin Cochrane. Canham was quickly into the action as his cross field pass found Craig Watkins who advanced into the area on the right but his shot across keeper Lance Cronin was well wide of the far post. 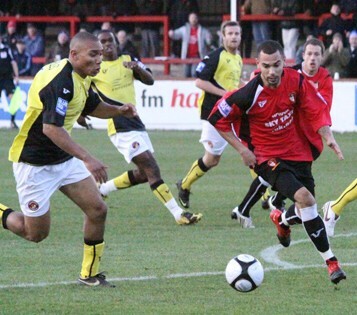 Just a couple of minutes later an exchange between Ebbsfleet’s Alex Stavrinou and Ricky Shakes saw the latter’s shot blocked by Simon Overland outside his area and as the ball returned to the Fleet man his second attempt was charged down by Green. With just six minutes played the third good chance of the game came the way of the home side as Canham found Steve Basham who helped the ball neatly between the centre-backs to Marwa who was denied by an outstretched leg from Cronin who did well to spread himself. Chances still came the way of Hayes & Yeading as Basham and Watkins exchanged passes on the edge of the area and Watkins angled a drive across Cronin that went a fraction wide of the far post. The Fleet then created a couple of openings that could have seen the visitors take the lead. Firstly, a long punt forwards found Stefan Bailey, Overland did well to tackle him outside the box and as the loose ball ran to skipper Peter Holmes he was denied a free shot at goal by a well timed Marwa interception. Holmes was also involved a few minutes later when he slid the ball into Shakes run on the right of the area, Overland doing well to push his shot wide of the target. Nine minutes remained in the first period when the deadlock was finally broken. 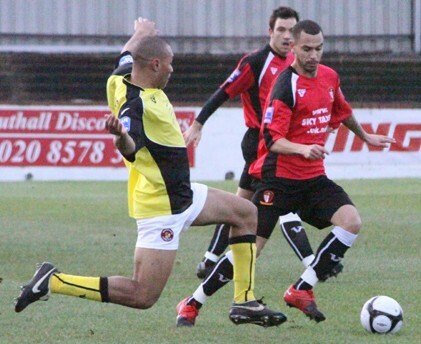 The tenacious James Mulley taking the ball from Leon Crooks before outpacing the defender to the byeline where he cut the ball back past Cronin and Watkins slid in at the far post (pictured above) to net his first Hayes & Yeading goal at Church Road. On the stroke of half time United were indebted to Overland and Cadmore as Ishmael Welsh outpaced Matt Ruby, his shot being pushed away by the United stopper and skipper Cadmore slid in to stop the approaching Shakes from hitting the empty net. The second half took a while to get going with the first chance coming after the hour mark when Marwa found space on the right side of the Fleet box, his low cross just evading the sliding boot of Basham. Basham only had to wait three minutes to join the scoresheet though. Mulley brought the ball forwards before finding Esmond James, a half time replacement for Watkins, on the right. His superb first time centre was met by the head of Basham, Cronin pulled off a fine point blank save but the United striker was quickest to his feet to poke home number two. Number three for the home side was only five minutes away as Mulley took the ball from Crooks after the defender appeared to get it caught under his feet. Mulley advanced on the left before cutting the ball to the far post where Basham arrived to force home his second of the afternoon. Far from being downhearted, the visitors were soon to have their best spell of the game. An inch perfect throughball found substitute Scott Ginty clean through on goal, as Overland came out to meet him a superbly timed Cadmore tackle took the ball away for a corner. Minutes later Vieira also burst through the middle of the home defence and with Matt Ruby on his tail he shot too close to Overland and the United stopper grasped the ball at full stretch. 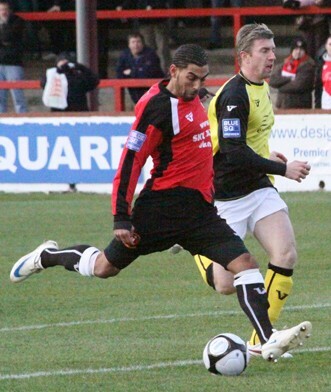 Vieira soon added his name to the scoresheet though as fellow substitute Clint Easton played the ball into the area a first time strike from the Fleet man beat Overland at last. 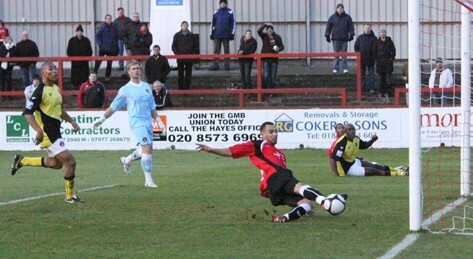 The goal of the game for Hayes & Yeading followed almost immediately though. Starting in our own half, Canham fed Dale Binns, he exchanged passes with Mulley before finding Basham on the edge of the area, he played the ball right to James who took a touch before rifling a shot across Cronin and into the far corner of the Fleet net. Stoppage time almost saw the goal of the season as Canham noticed Cronin off his line and tried an audacious lob from the halfway line, the Fleet keeper backpedalling frantically before tipping the effort over his crossbar. The scoring was not finished though, with United down to ten men as injured Adam Green had left the fray, a long punt from Darius Charles was instantly controlled in the box by Ginty who confidently beat Overland to reduce the arrears. United Man of the Match: Marc Canham.